It’s not 100%, but I am pretty sure I am throwing in the towel on this seasons off-the-shoulder trend. Not that I don’t love and adore this fun trend, but I’m taking a break. Not from wearing one, from finding one. This trend proves what I already knew; not every trend is for everybody. 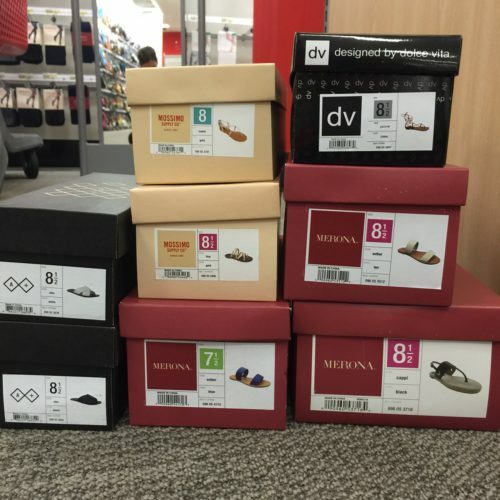 Retailers are going insane with this trend; you can pick one up at every price and size. Instagram is exploding with darling outfits; styled up with the cutest ever, off-the-shoulder blouses and tees. I really tried – but my shoulders will simply not cooperate. Every single piece I have tried, believe me it’s many, the shoulders instantly ride up and I am left with a peasant blouse. If I was after a peasant blouse, fine. But, I’m not. After investing many hours in searching for the right top – I’ve come to the conclusion that the cold shoulder look is where it’s at for me. Still showing some shoulder, no strapless bra required – this is my girl. Now, for those of you blessed with shoulders that will keep this style in place – you are in luck. While out hunting for a top this week, one of my stops was J Crew. 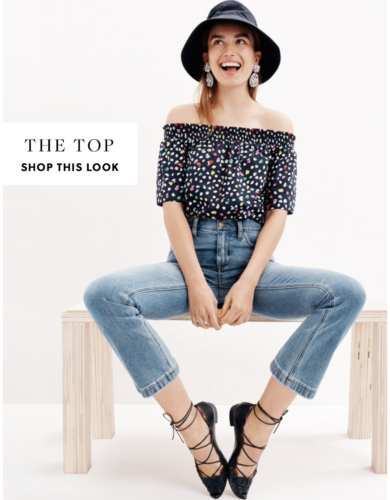 I absolutely love the J Crew Off the Shoulder Top, HERE. Available in solids and prints – this was going to be my top. My favorite? The blue and white stripe. I had visions of wearing this with a denim skirt, white or blue denim shorts, jeans, even a black pencil skirt. But alas, we were not meant to be. See how the models shoulders are straight and mine are sloped- that’s the problem. As you can see, the shoulders ride up – and stay up. I love the bright yellow color, as well as cat print, and white. This top has great reviews, and the stripe version is already on back order. I think it runs a tad small. I am wearing my regular J Crew size 4 here. I would consider sizing up – for a more blousey look. 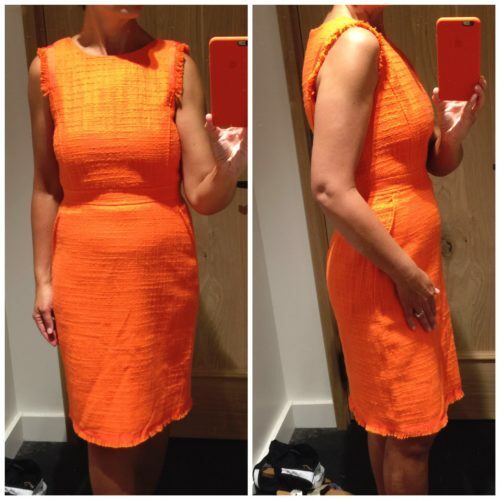 While at J Crew, I tried on a few other pieces. Note: the dressing room lighting, in this particular store, was horrible! Keep that in mind when looking at the photos – the “glow” you see here, may not actually be as glory in real life. I loved this twill skirt (almost like a light weight denim), HERE | now an additional 30% off the marked down $69.90 price | available in 3 colors. I am wearing a size 2 here, which was too tight (couldn’t zip it all the way). The sales person was able to find a size 4 for me in another state – it’s on it’s way to me as we speak (under $40.00, how could I say no?). I think this skirt will be a great staple for the summer. Next, I tried on the Textured Tweed Sheath Dress, HERE | now an additional 30% off the marked down price of $109.90. | available in white as well. I thought this would be a great dress for work – which it was. But, I really didn’t need another work dress – I am currently lacking in the casual/everyday department. This dress has great reviews and could be worn for many summer occasions. I love the orange – it makes me happy! Next up, another J Crew pick. The Tiered Eyelet Midi Dress, HERE | Now 30% off $148.00.| also available in black. This dress screams summer! Pair it up with a straw hat and sandals – off to the Farmer’s Market you go! At nighttime, pop on a denim jacket and wedges – al fresco dining here you come. I am wearing a size 4 here, which is my regular size. As you can see I need a 2 in the hip – but then it would be too tight in the waist. For reference I am short waisted and my shape is straight up and down. Any other body type would look great in this dress! 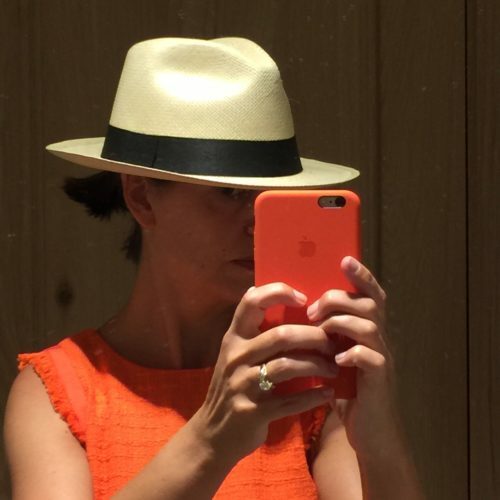 Speaking of Farmer’s Market, I love the Panama Hat at J Crew. It’s sized, so you can get the right fit. I purchased this hat last summer. Only issue, it doesn’t pack all that well. But if you wear it on the plane or don’t plan to travel with it – it’s a great shape that goes with everything! | Available in 3 colors. 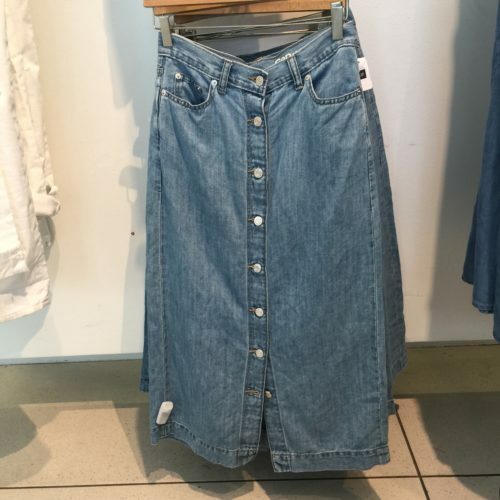 Another piece I have been on the hunt for is a denim skirt. This is a bit short for my liking (I prefer a midi length) – but it is a really cute skirt, HERE | also in white and 30% off $98.00. Like most J Crew items, this skirt is also available in petite. I have one here on each foot, bottom left. I liked the ‘Malta’ (right foot), but the ‘Bali’ ( on left foot) was a better fit for me. Fit was pretty true to size. Cheep and cheerful, currently on promo. On the way out, I spotted this denim skirt. I did not have a chance to try it on, but it’s sold out online – the people have spoken! 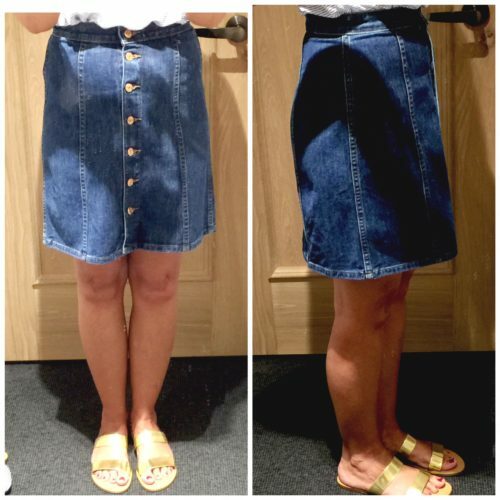 Speaking of denim skirts, how cute is this piece? Looking for lace-ups at a great price? Well ladies, that’s a wrap for today! Do any of these pieces catch your eye? Anyone tried out the cold-shoulder look yet? If so, how’s it going for you? 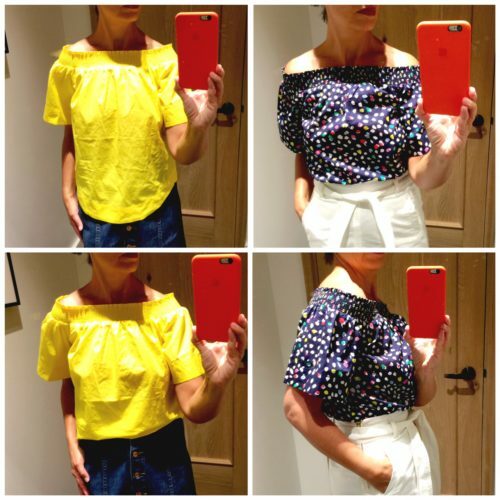 I’ve ordered a few cold shoulder tops to try – I’ll be sure to share, once they arrive! Be sure to pop on back this Wednesday for more summer finds – let’s get you summer ready! A quick note: “Blogs I Read” has been added back onto Ask Suzanne Bell. This is a list of blogs I personally follow, not all, but regulars. This page automatically updates – whenever the author posts something new. Therefore the most current post lands at the top. My hope is that this new format makes it easy, so you don’t have to hunt around for your favorites. While you are here visiting, you can simply pop on over and see what’s new out in the world of blogging. Not all are fashion or style blogs, you may just find one you love! 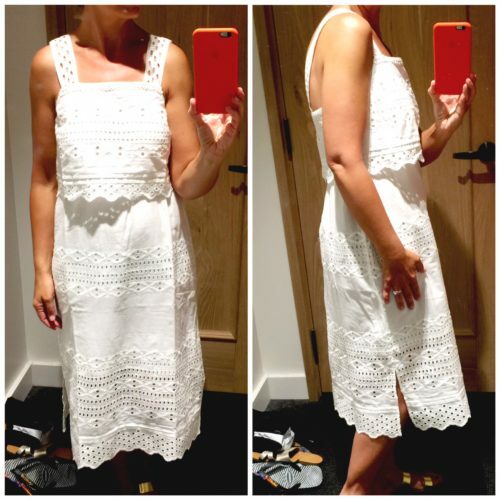 I like that white eyelet dress for summer. The off tge shoulders tops come with straps too and i find they stay put better so you don’t need to be adjusting the elastic for comfort every time you move your arm. Keep looking and you will find that off the shoulder style that works Free People and Anthropologie have some boho cute ones. . So cute !!! You found some great pieces. 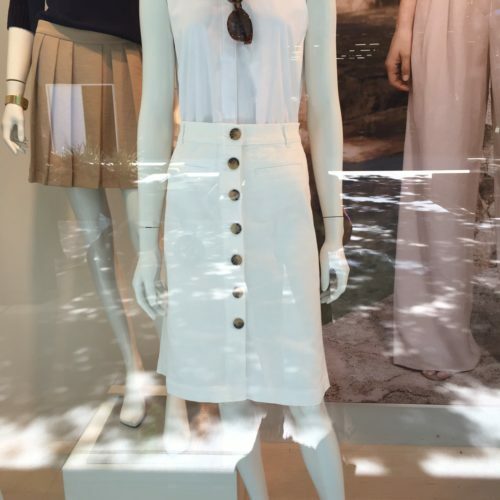 I especially love the white ann taylor skirt! I love the buttons and it seems to be a good length! Have a wonderful weekend, suzanne! What is iy about bad lighting in fitting rooms?!! Most of the ones i go in are horrible. Don’t they reaLize this is where we make the decision To actually purchase someththing? 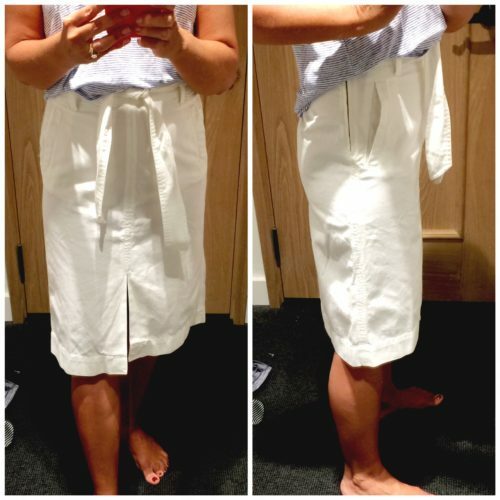 Anyhow, that white twill skirt is amazing, i can see why you got it, so happy they were able to find your size. Love those lace up sandals at target too. And i hear you about getting casual items. So often i am “dress heavy” in my closet and i love a really cute pulled together casual look. I find it more difficult to pull that Off. I loved your last post with the round Up of casual looks. Wonderful post! Hi Janeane! Seriously, someone needs to get this right. J Crew, Target, Kohl, Ann Taylor – they are all bad. Nordstrom is OK with theirs. When I worked in retail I could never figure out how they could never get the mirrors and lighting to be a bit more true. Guess they didn’t run it by us first, :)! Judee! That is so cool! Did it ACTUALLY work? No Pinching under the armpit? I have to give this a try. Thank you for sharing this tips with all of us! Great seeing you here!